Online giving coupled with the Internet’s love for feel-good altruism stories has resulted in an array of spontaneous displays of philanthropy. Most recently, a story broke about the Girl Scouts turning down a $100,000 donation after the donor allegedly asked to exclude transgender girls. The organization immediately took the problem to Indiegogo, where it bested the rejected donation threefold. But there are also the flash-in-the-pan human interest stories that catch fire, like the video of a homeless man competently playing a piano placed on the street as part of a public art project. This Sarasota, Florida nonprofit has a pretty simple, melodic message: place pianos around the city and allow members of the public to create music. Like public art, public music often has the ability to draw and captivate a street audience. Sometimes that interaction creates a deeper, more meaningful connection between performer and audience, as was the case for homeless man Donald Gould, 51. The only difference is Gould’s audience has ballooned into over 12 million. What’s creepy about the whole story is the underlying assumption that homeless people are without skills, histories, or essential worth and that when you find one that is skilled, that person is some kind of anomaly. But that is the iconic storyline here, and it has worked to focus attention on this one individual. Since the video went viral thanks to a few pedestrians and a large part in Sarasota Keys’ mission to spread music, Gould has received a hair cut and been given temporary housing. A crowdfunding campaign for him has hit over $35,000 and he has been offered a scholarship to pursue a college degree. Perhaps most poignantly, Gould has been reunited with his 18-year-old son. Still, the story not being told here is about the general public’s misconceptions about the perceived general uselessness of people who are homeless and how those assumptions prop up bad policy. 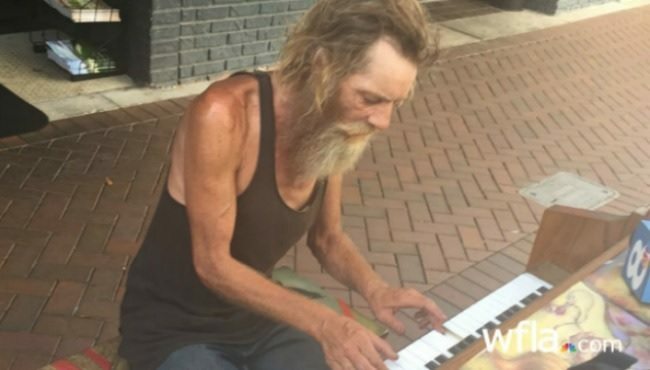 The headlines were illustrative: “This Homeless Man’s Talents Will Amaze You!”; “Homeless Man Shocks the Internet…”; and “Homeless Man with Amazing Piano Skills….” The shared Facebook posts and Tumblr entries don’t come with statements saying that this kind of talent among homeless folk is not an isolated phenomenon. Rather, there is a sense of wonder that a full human being was found where the public assumption was that none existed. The Internet has a short attention span, and as with most Internet “celebrities,” Gould’s story will likely be old news by next week. Worse, he might stumble and be excoriated for it, reinforcing all of those public judgments of worth. Still, we can expect to see this kind of online philanthropy continue to grow as our digital abilities expand and diversify. The variety of charity phone apps and new forms of digital giving have already contributed significantly to the shift in how we see charity—as a natural response to a story that moves us. Before the week is over, the Internet may have found another Donald Gould and another cause to crowdfund. Though small donor-giving is in decline, a new charity organization focuses on bringing millennials to the table through improved digital outreach. Is this particular response useful?